I always raise my eyebrows to recipes that say – the perfect this or the best that. You are already setting yourself up for disappointment – because invariably they aren’t perfect or the best. And what does perfect mean? Is it the author’s perfect omelette? Perfect to me means flipped on both sides rather than folded – and with cheese and chilli. For the author I imagine it means this is the perfectly balanced and healthy omelette to have for breakfast to start the day given that this omelette comes courtesy of Honestly Healthy for Life. It’s very simple and very very tasty. We’re usually very lax at breakfast time and either don’t bother having any – or grab a slice of toast at work. But we’ve noticed we don’t feel great when we snack on bread so we thought we’d try this instead. It’s not obvious from the picture – but this is a two egg omelette which had quite a bit of parsley chopped into the egg. While it is frying in the pan you add some chopped tomato and mushroom (which you’ve previously cooked for a few minutes). You put the filling on one side of the omelette then top with fresh spinach and red chilli (if you want), then fold, cook for a short while and then flip. 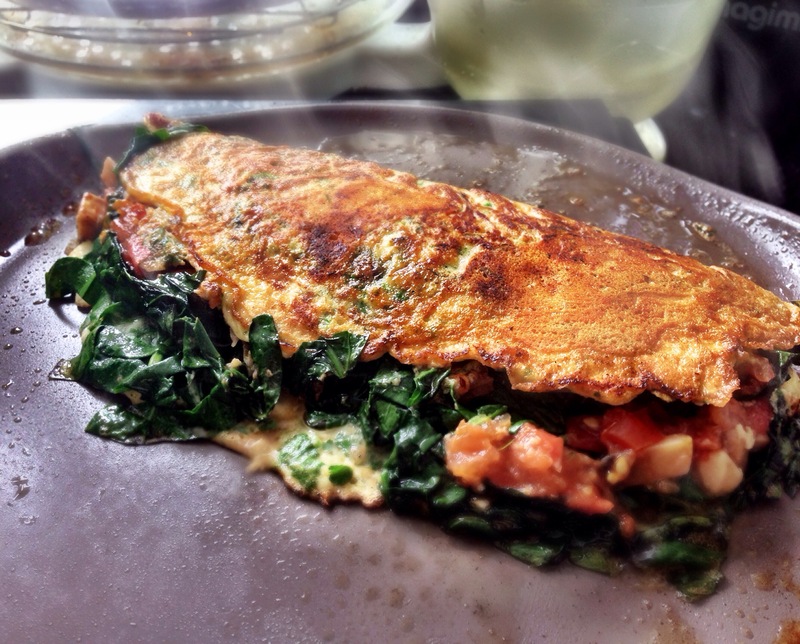 You think the spinach won’t fit inside the omelette – and it doesn’t to start with – but it soon wilts – and when you fold it it all fits in nicely. I thought my perfect omelette was a three egg, mint, pea and feta omelette – but this one really does come close. It was fantastic. And it is clearly more healthy than the one I usually make! This entry was posted in Honestly Healthy for Life, Natasha Corrett & Vicki Edgson, Vegetarian, Want to make again and tagged breakfast, food, recipe by tenuoustoaster. Bookmark the permalink.